The new Fiat 500L - the small MPV version of the popular 500 - will cost from £14,990 on the road when it goes on sale early next year. That gets you the base 1.4-litre model with standard equipment including cruise control, a touchscreen radio, Bluetooth, leather steering wheel and six airbags. The trim line-up starts with two specifications - called Pop Star and Easy. Both cost the same but have differing features so the Pop Star has a body-coloured dashboard, alloy wheels and door mouldings while the Easy gets rear parking sensors, a soft-touch dashboard and electric rear windows. 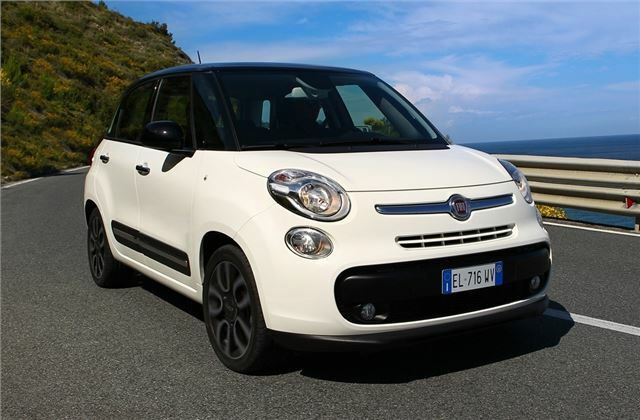 The Fiat 500L was also recently awarded a five star Euro NCAP crash safety rating. Top Lounge versions have climate control, 16-inch alloys, rear parking sensors, electric rear windows, a glass roof, automatic headlights, rain sensitive wipers, front fog lights and a rear armrest. Fiat is going to town with the options too with an audio system designed by Dr Dre and even an on board Lavazza coffee maker available. All models come with the choice of either a body coloured, white or black roof plus the option of silver, white or black alloy wheels. Delightfully named paint colours include Heavy Metal Grey, Opera Red, Bashment Blue, Vocal Green and New Age Cream. The engine line-up has the 0.9-litre TwinAir with 105PS along with a 1.4-litre petrol with 95PS while there are two diesels: a 1.3 MultiJet with 85PS that's also available with an automatic gearbox, plus a 16 MultiJet with 105PS.